House prices: Is now the time to buy that holiday home in Spain? Sun-seeking Britons are buying up holiday homes in Spain as the Mediterranean country’s property market – battered by the eurozone crisis – begins to look brighter. According to new research sales have soared by 56pc this year, compared to 2011, and are up 25pc on 2013. The strengthening pound combined with cheap Spanish property prices have made villas in areas such as Andalucía attractive to increasingly confident Britons, according to Currencies Direct. Phil McHugh, trading floor manager at Currencies Direct, cited the general improvement in the UK economy as a driver, along with low interest rates which are still pushing people to invest in property rather putting money into their savings. 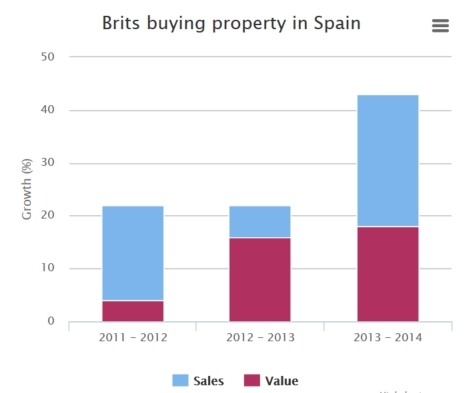 The recent house price surge in the British housing market has also encouraged those in retirement to sell up and release equity to buy in Spain. “The strength of the pound against the euro, which means buyers are seeing their money go further, [is] boosting appetite for big-ticket investments like overseas property,” Mr McHugh added. House prices in the Spanish residential property market fell 7.7pc between April and June in 2009 amid eurozone turmoil. Thousands of expats splashed out on their dream property thinking the market had hit the bottom only to see it fall again in 2012. “US and other overseas investors are only moving back into Spanish real estate, both residential and commercial, when they can see fundamentals in place concerning limited supply of prime property,” he added. However, concerns are building over the continued strength of the pound given Britain’s deficit which is approaching record levels, and clouds are once again gathering over the eurozone. These factors could dampen the Spanish property market in the months ahead.